Ever since I can remember, I have been fascinated with “materials,” such as glass, iron and other metals, stone, brick, and wood. When I was five, taking art classes from Prof. Nelson at Alfred University in New York state, I made a collage of the “Three Kings” using gold and silver foil on a painting. Later, in high school, I applied pieces of colored plexiglass and pieces of copper. In my college weaving classes, I added natural fibers, seed pods and dried stems and branches from the fields in Ohio. Over the years I have added “found” antique metal and wood objects to my sculptures. And I have always carried in my mind the sculptures at the then newest and most fashionable mall in Michigan called “North Woods” or something like that, when I was in 5th or 6th grade. My favorite large outdoor sculpture there was a fountain with an iron tree form enclosing large pieces of stained glass. I had constant and stimulating exposure to museums, art exhibitions, and art production– and it existed side-by-side with my deep appreciation of natural beauty. When I first read Wordsworth in a British Literature course in college, I realized I had always had a romantic passion for the outdoor world. Having run out of space here in the Florida studio (as I produced in some recent years as many as 200 paintings in a single year), I gave up my three dimensional explorations of “objet trouve” sculptures, and began using foil and gold leaf in the two dimensional paintings. I tried to increase a sense of texture, piling up layers of paint and using techniques where I scratched through the paint to the underlying canvas. But two years ago, I decided that canvas was too flexible and light to support added materials such as wood and wire. I needed a support that could be drilled and nailed into, and onto which glass or other materials could be glued. I began experimenting with wooden furniture years ago, using faux finishes to “spectacularize” thrift shop finds with classic styling. For example, a 1930’s tea table with a three piece top in boring no-grain mahogany became totally transformed with a burl look using blue, black, burnt sienna and burnt umber paint. New wood chairs became heirlooms by adding paint and sometimes gold leaf, and aged tapestry designed fabrics. But then came the recent focus on the Maine coast again, and wood came into the paintings as well. I am including two recent paintings on wood in this post. Both are 3 by 4 feet on interestingly grained plywood from somewhere in Asia. One is a seascape, the other is built on Eiffel Tower images. I desired to achieve a synthesis between the “painterly” and the use of wood grain. In each, layers of varnish and color staining the wood was a foundation. In the seascape, I kept the treatment in contrasting horizontal bands. On the Eiffel Tower piece, I used vertical, horizontal, and diagonal “streets” of unstained wood surrounding areas of color, including red, blue, green, and earth colors. In the ocean painting I used painted driftwood and some glass, along with painted wooden “sticks”–to mimic sunset cloud colors and active surf. 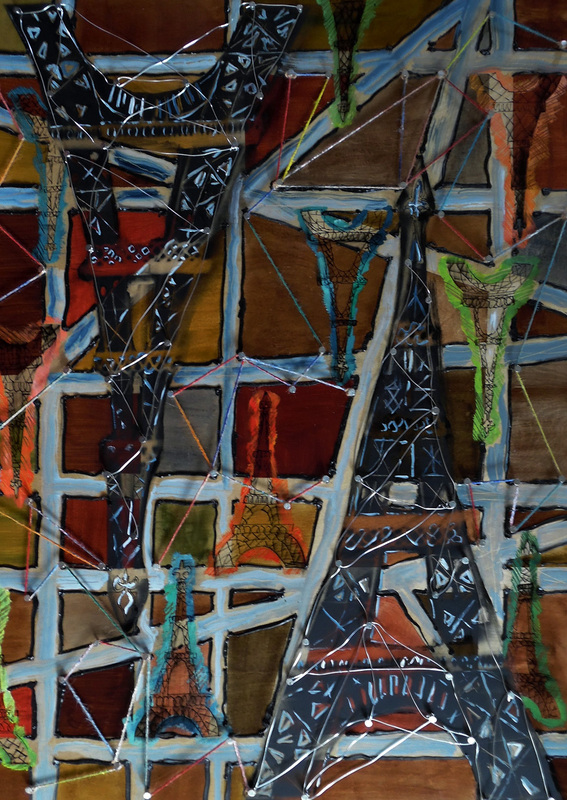 In the Eiffel Tower piece, I added flat black sprayed images, roofing and gutter caulk, metal wire and painted hemp twine raised above the wood surface with galvanized roofing nails. Somehow, the new work satisfies my longing to do more with wood, the material that literally envelops my life in Maine — the forests, the lumber, the ships, the houses and barns, and so forth. But it also is paving the way for more experimental paintings that will take the Maine wood experience to other places in the U.S. and the world (think Maine in Manhattan or Los Angeles or…). I especially like the way the small panels on basswood in the ocean painting give cinematic aspects of the many faces of the Schoodic Peninsula, adding to–without detracting from–the calm spirituality of the larger context. Yes, I would, and could, keep working in wood! Perhaps you recall the “tongue twister” from childhood: “How much wood could a woodchuck chuck, if a woodchuck could chuck wood?” The answer is, of course, “a woodchuck could chuck as much wood, as a woodchuck could chuck wood.” I’m chucking! And loving it!